Destination weddings aren’t for everyone. The sun, the umbrellas in the cocktails, not to mention hanging out with your friends and family nonstop for a few days — ugh, sounds terrible! Ok I’m (mostly) kidding. But seriously, if you dream about picking the right texture of frosting for your caramel frappuccino chocolate cake and are excited by the challenge of finding a third gluten-free, vegan appetizer so your second cousin will have something to eat, then the laidback vibe of a destination wedding might not be for you. If, on the other hand, you’re down for an adventure with your besties that might not go exactly as planned, but is sure to be memorable, then you might be a candidate for a destination wedding! I chose a destination wedding in Hawaii to save money, keep the guest list short, and get an affordable, intimate weekend trip with our closest friends. We hung out on the beach, grabbed food together, took hikes — it was like we were at summer camp, in paradise and with our BFFs. So how do you enjoy your destination wedding and not get drawn into the drama and details that can accompany any wedding? For example, we didn’t account for the tide, so our beach wedding got moved from the sandy shore to a bluff with the ocean in the background. Let go of that image in your mind, of the other wedding you could have had. The sooner you stop comparing the two, the sooner you can enjoy the wedding you’re actually having! Regardless of if you’re going with a package wedding at a resort or a complete DIY on the beach, there will still be decisions to be made once you arrive. But if you already decided what you care about, everything else can be handled by deferring to your proxy. This part is worth repeating: defer to your proxy. My elementary school teacher friend (read: organized, action-oriented and great at wrangling people) stepped up and fielded the questions I didn’t care about. Eventually, I realized I was redundant, looked her in the eye and said, “Thank you, I trust your judgment,” and then left to do some yoga before the ceremony. Decide ahead of time who is making the decisions you don’t care about and then let them do their job! Weddings equal at least a little bit of drama. People will ask you if the decorations are just right, if the bridesmaid dresses are all the same amount of wrinkled, if there’s enough food. Remember, everyone means well: they just want everything perfect for your big day. Does your soon-to-be mother-in-law have really strong feelings about how the tables should be set up, and you couldn't care less? Let her win this one, because it’s really a win-win. You don’t have to make the decision and she gets what she wants. If you did step one, you know what the most important aspects of your wedding — focus on those, try to let everything else go and practice saying “I trust your judgment” while smiling and walking away from the drama. Do what you need to do before your wedding to be present and relaxed. The morning of my big day I started off trying to do too much — prepping food, consulting on decorations — instead of letting my wonderful friends handle all the things, thus stressing myself out. I eventually left the prep area, and made time for myself to get excited about what was happening: marriage! My advice: Decide ahead of time what you want to do before the wedding, instead of micromanaging the details, so you can pack any necessary supplies like a yoga mat or running shoes. 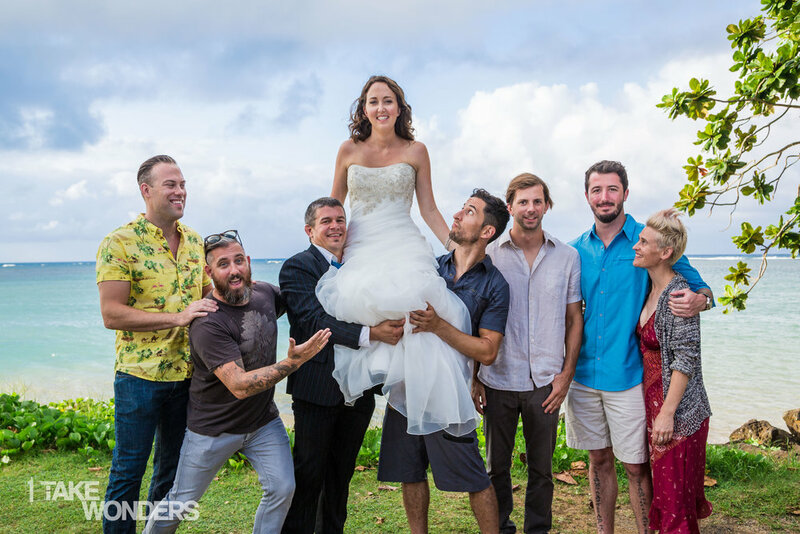 Half the fun of a destination wedding is that the fun doesn’t end after the ceremony. We scheduled a brunch, beach time and another dinner for the next day. What do you and your fiancee love doing? Rock-climbing? Surfing? Treasure hunting? Plan activities that reflect both your personalities (and consider your friends’ lifestyles). Just make sure to give your friends and family a heads up on all the extra activities so they can come early and stay late! Are you considering a DIY destination wedding? What questions do you have? Tami Weiss is a writer, photographer and environmentalist living in Santa Cruz, CA. Her favorite hobbies are brunching, reading, organizing and yoga-ing.